Want to know what happened during the August 2015 Cincinnati Real Estate Market and Northern Kentucky Real Estate Market sales period? You have come to the right place. 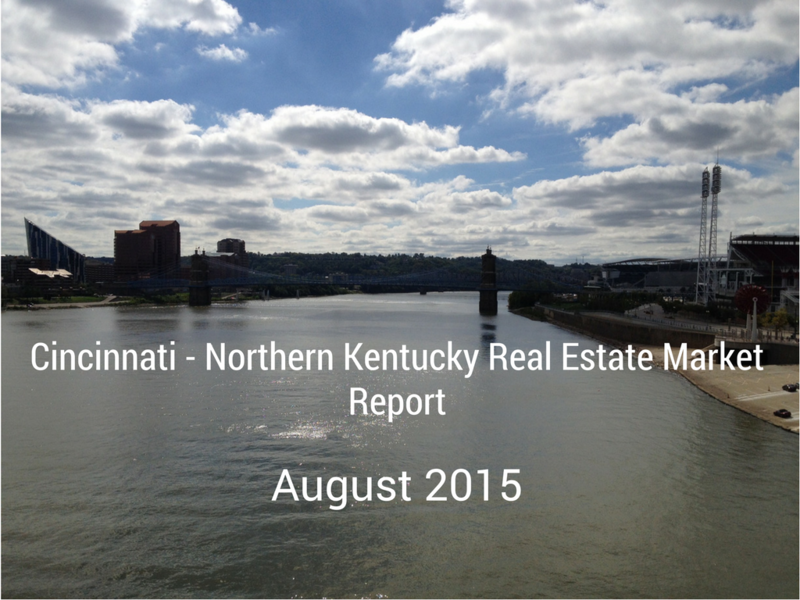 Read on to get the latest statistics and information in the August 2015 Cincinnati-Northern Kentucky Real Estate Report. While home sales were a bit lower number wise due to the summer break, August continued to show strength compared to last year in the Greater Cincinnati area. In August there were 1017 homes that closed during the month for Hamilton County and 251 homes that closed for Clermont County. Homes that went pending in August were 792 for Hamilton and 223 for Clermont County. Pending status means they had an offer accepted and were awaiting closing pending inspections, appraisals, financing etc. The average listing price for homes in the Hamilton County area was $244,032.00 with an average selling price of $186,517.00. Hamilton County homes during the August time frame were on the market (Days on Market) for an average of 86 days. There are currently 3,558 homes available for sale in Hamilton County. The average listing price for homes in the Clermont County area was $219,293.00 with an average selling price of $183,759.00. Clermont County homes during the August time frame were on the market (Days on Market) for an average of 77 days. There are currently 956 homes available for sale in Clermont County. In August there were 208 homes that closed during the month for Boone County, 229 homes that closed for Kenton County and 108 for Campbell County. Homes that went pending in August were 160 for Boone, 169 for Kenton and 91 for Campbell County. The average listing price for homes in the Boone County area was $242,247.00 with an average selling price of $190,460.00. Boone County homes during the August time frame were on the market (Days on Market) for an average of 87 days. There are currently 698 homes available for sale in Boone County. The average listing price for homes in the Kenton County area was $204,429.00 with an average selling price of $156,220.00. Kenton County homes during the August time frame were on the market (Days on Market) for an average of 122 days. There are currently 858 homes available for sale in Kenton County. The average listing price for homes in the Campbell County area was $213,294.00 with an average selling price of $155,249.00. Campbell County homes during the August time frame were on the market (Days on Market) for an average of 117 days. There are currently 497 homes available for sale in Campbell County. All of the above numbers take into account single family homes and condominiums but do not take into account farms and multi-family homes. If you are ready to sell or buy a home I welcome the opportunity to assist you in that venture and encourage you to call, text or email me today! About the author: The above information regarding the “August 2015 Cincinnati – Northern Kentucky Real Estate Report” was compiled by Paul Sian of HER Realtors. I work in the following Greater Cincinnati, OH and Northern KY areas: Alexandria, Amberly, Amelia, Anderson Township, Cincinnati, Batavia, Blue Ash, Covington, Edgewood, Florence, Fort Mitchell, Fort Thomas, Hebron, Hyde Park, Indian Hill, Kenwood, Madeira, Mariemont, Milford, Montgomery, Mt. Washington, Newport, Newtown, Norwood, Taylor Mill, Terrace Park, Union Township, and Villa Hills. Visit my website at www.CinciNKYRealEstate.com & my blog at www.CinciNKYRealEstate.com/blog. © 2015, Paul Sian. All rights reserved.